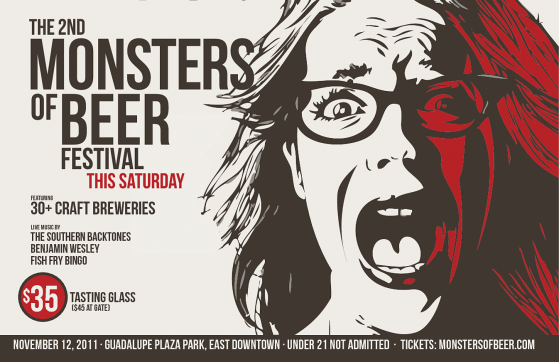 The 2nd annual Houston Beer Week kicks off this Saturday, November 12th, with the Monsters of Beer Festival at Guadalupe Plaza Park. Over 60 beers will be available from at least 30 craft breweries and half of those are breweries from Texas. Tickets are available online for $35 and for $45 the day of at the festival. There will be various food trucks onsite for when you get hungary and an expanded silent auction of beer and beer related items to bid on. You can can also enjoy your beer knowing that 100% of the Monsters of Beer Charity Festival net proceeds go to Live It Big, a non-profit organization that supports startup and small charities, so you're actually helping others by drinking craft beer.